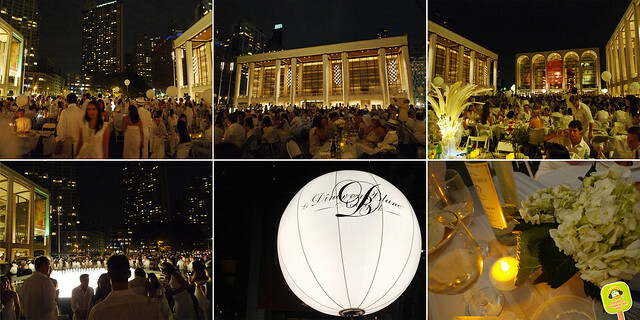 It’s been a year since I’ve been on the priority wait list for Diner en Blanc, so you could imagine my excitement when I finally got the confirmation. Last year, their first event in NYC got a bit messy due to system errors that allowed everyone to sign up, thankfully this time around things were a lot smoother. 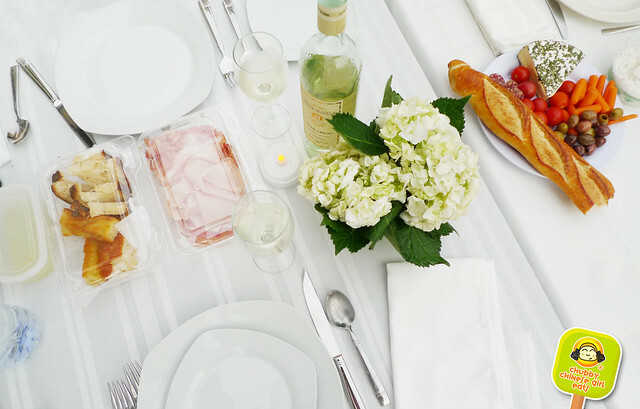 Creator Francois Pasquier started this “white” picnic with a handful of friends in Paris (white was easier to spot in the crowd). 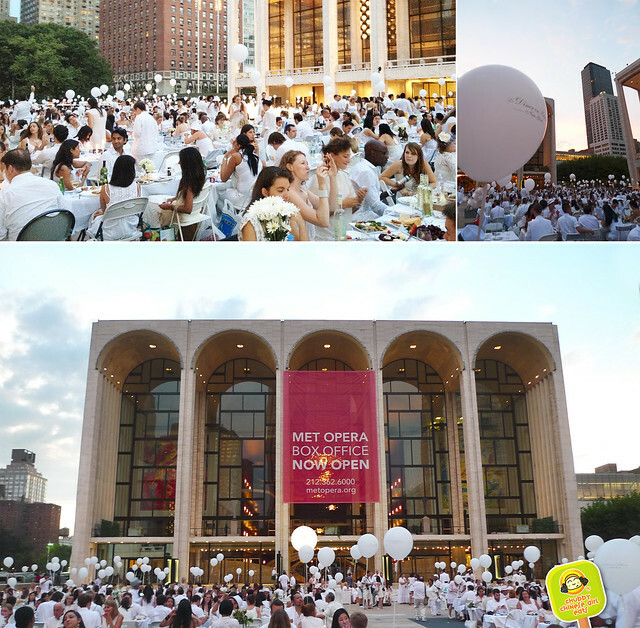 Now, 24 years later, Diner en Blanc has spread to 22 cities across 5 continents. 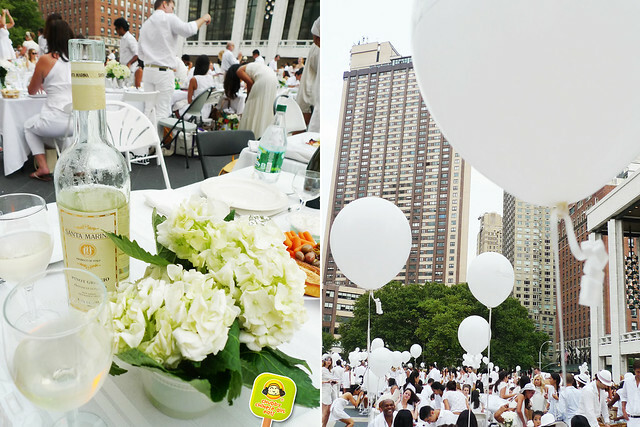 Totally viral, part flash mob and part fancy dinner party/picnic. The location is kept secret until the last minute. We met our table leader between 72nd St. and Amsterdam. With our table, chairs, plates, utensils, decoration and food at hand (yes, it did sound like a lot of work and we had trouble finding foldable chairs over the weekend, but in the end it was well worth it). Walking the streets painted in white, I wish I got a dollar every time a pedestrian stopped and asked what was going on. 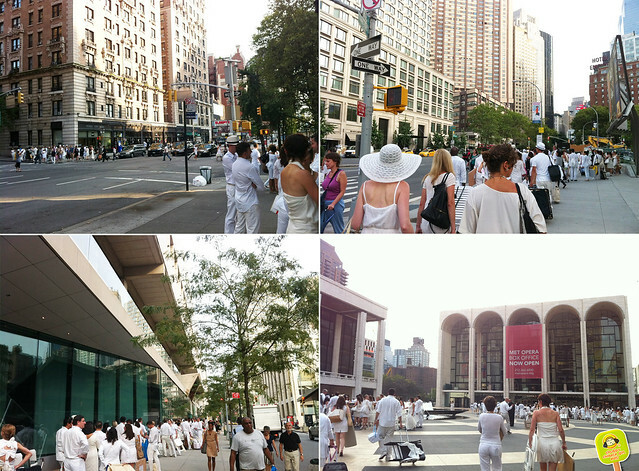 As we got closer to Lincoln Center, it was confirmed, this was it, what a pleasant surprise! Perfectly organized, we set up by rows, led by our section and table leaders. 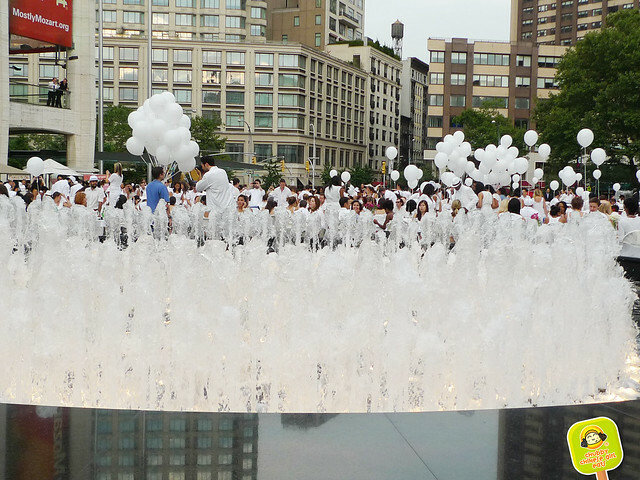 Soon enough, Lincoln Center was splashed in white. The weather was perfect. Warm with a light breeze and zero humidity (so thankful, my hair didn’t go crazy). Wine had to be ordered from their website, while StalkerBoy started setting up, I rushed in to get our booze. No plastic plates, cups or paper napkins. 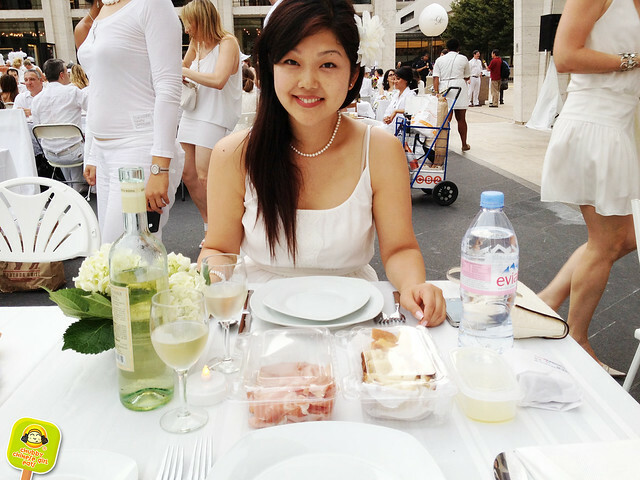 This was the most elegant picnic I’ve ever attended. I ordered from Salumeria Rosi for this ultimate picnic. A light Tuscan tapas menu with quality meats and cheeses. As always, it didn’t dissappoint. SELEZIONE DEL SALUMIERE 7 different cured meats from Mortadella, Soppressatta to Prosciutto. With a hard cow milk cheese brined in red wine. Along with country bread and olive oil. Being in white and all, I though I died and went to food lover heaven for a second there, while sipping pinot. PONTORMO is Chef Cesare’s signature salad. Market greens, soft scrambled egg, guanciale and pancetta. They packed it really well and kept the dressing separate, so it held up for a couple hours. Loved the pancetta pieces for that extra salty/fatty bite. PANCIA slow cooked Berkshire pork belly with Tuscan spices over chickpeas, blanched greens and crispy skin. Oh yes! The greens absorbed all that pork flavor. Tender with that nice crunch from the skin. It actually was lighter than expected. TRIPPA traditional stewed honeycomb tripe with Italian tomatoes, rosemary and garlic. Very comforting. The acidity and sweetness from the tomatoes cut the heaviness of the tripe. My PANNA COTTA didn’t do too well with transport, but it tasted fantastic. StalkerBoy’s AMARETTO & CHOCOLATE FLAN was really good as well, but I had a little accident and so, our desserts didn’t end up too pretty. BUT L’Arte del Gelato cart was around and I had a luscious OLIVE OIL gelato to end our wonderful meal. As day turned to night, the lights flickered and Lincoln Center was more magical than ever. 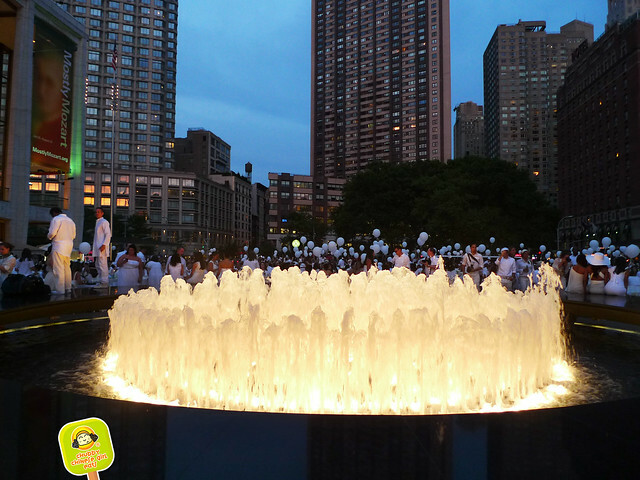 Even the fountain looked extra beautiful. When the dark took over, the party started. The dance floor opened up and everyone was dancing the night away, it was awesome! “Glad you came” Yes, I am glad I came, very very glad indeed. Grand finale of “New York, New York”, what an appropriate song to end such a magical night. Lincoln Center will never feel the same again. And though we had trouble finding foldable table and chairs, I would do it all again in a New York minute. Hopefully I can experience it in another city and country. Until then, this set the bar for any future picnics. 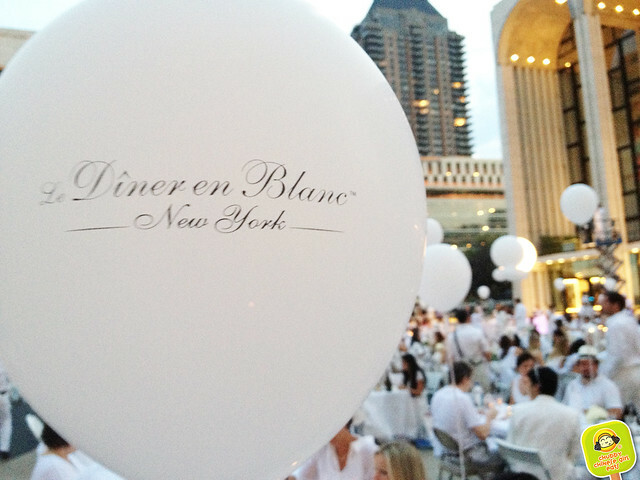 For more information check out Diner en Blanc website.